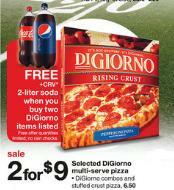 Pay $9 for 3 large pizzas and a 2-liter of soda! Super Bowl Sunday is fast approaching, or have a family pizza night. Remember, if you have a Red Card, you’ll pay even less! It works out to $2.85 per pizza.